Coming into the third game of the preseason, the battle for roster spots is heating up and this week is all about who can really start to separate themselves from the rest of the pack. With injuries piling up for the Patriots at multiple starting positions, we'll see a lot more of the players on the roster bubble get some first team reps.
QB- The big story line here couldn't be more obvious. 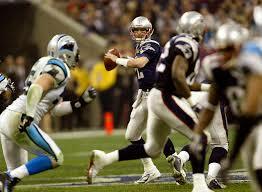 Will we finally see Tom Brady in game action for the first time during the preseason? If so, how will Bill Belichick split the first team reps between Brady and Garappolo? The Panthers stout defensive front is sure to be the biggest test Garappolo will face this preseason. Let's face it, the Saints and Bears defenses aren't particularly good so these reps are crucial for Garappolo's preparation for the regular season. RB- With the news of Dion Lewis having another surgery, LeGarrette Blount and James White are now roster locks. Tyler Gaffney will very likely make the 53 man roster as well. While I believe Blount currently has the inside track for the starting job, keep a close eye on Gaffney this week as he makes his case to become the starter. Will we see any of undrafted rookie DJ Foster? There was a lot of hype surrounding him after OTA's, but it's put up or shut up time for Foster. WR- The fifth and likely final roster spot at Wide Receiver has pretty much come down to Aaron Dobson and Keshawn Martin. Dobson has been unspectacular so far, but I have a hunch he'll stick on the 53 man roster. Depending on Danny Amendola's health, Keshawn Martin may crack the roster as well until Amendola is ready to return from PUP. The competition is still wide open, although I think at this point DeAndre Carter is a long shot to make the roster. The coaching staff was really impressed with him, so he's a strong candidate for the practice squad. TE- If AJ Derby continues playing the way he has, I think he takes the number three Tight End spot away from Clay Harbor. While Harbor has been solid, Derby has been outstanding. Pay close attention to who gets the start opposite of roster lock Martellus Bennett in two Tight End sets, as that could be a good indicator of who's in the lead to win the job. Though Harbor has the versatility to play Full Back and was just signed to a two year, four million dollar contract, the upside offered by the younger Derby could be the deciding factor here. Offensive Line- Already decimated by injuries and down two starters in Sebastian Vollmer and Shaq Mason, the backups are the main focus here. The (hopefully) continued improvement of Marcus Cannon cannot be understated, and his performance may be the most important thing to watch for at any position. Josh Kline is a capable replacement for Mason, so thankfully there's not too much drop off in talent at Right Guard. Nate Solder continuing to get all the way back up to game speed is another point of interest. Keep an eye on Joe Thuney at Left Guard, who's quietly dominated this preseason and is looking like he could be the steal of the draft. Defensive Line- Terrance Knighton. I never imagined I'd be typing this sentence when the Patriots signed him last offseason, but he's in danger of being cut. After a poor performance in the first two games, he needs to show the coaching staff that he's going to be able to contribute in the Patriots system. His lack of experience in a 2-gap scheme is likely the reason for his poor play, and maybe the team will hang onto him hoping he'll improve as the season goes on. With Sheard, Ninkovich and likely McClellin out, look for Trey Flowers to continue to prove himself while getting first team reps. We'll likely see a sample of emerging play maker Anthony Johnson against the Panthers first team offense as well. LB- The trade for Barkevious Mingo and the fact that he's flying out to Carolina to join the team the night before the game makes me wonder if there's a chance he'll play. Mingo is an incredible athlete who was a poor scheme fit for Cleveland and under performed. While normally I'd be skeptical that he'd play on such short notice, the Patriots will likely be running a pretty basic defense for stretches of the game, so it's a chance for him to get in the field and gain some familiarity with his new team mates. CB- Cre'von LeBlanc and Darryl Roberts are fighting for the last spot at cornerback. LeBlanc has been very impressive thus far and has shown good play-making ability along with fantastic ball skills. Roberts had a rough game in week one while LeBlanc shined, so I give LeBlanc the slight edge in the positional battle for now. However, Roberts did bounce back and have a great game in week two. Roberts is raw, but has the size, physicality and athleticism to handle bigger receivers, so keep an eye out to see if Matt Patricia has him line up against either Kelvin Benjamin or Devin Funchess. The battle between these two Cornerbacks is possibly the tightest competition on the roster at any position, so it's definitely worth paying close attention to. Safety- Not a whole lot going on here. All 5 safeties are going to make the roster ( McCourty, Chung, Harmon, Richards and Grugier-Hill) with Nate Ebner and Brandon King counting as special teams players.